Cucumber skin care? I always plant cucumbers in my garden. This wonderful veggie is full of good nutrients for your face from the inside and out. It is a good source of Vitamin C and Molybdenum; both nutrients can help detoxify your skin and make it smooth and beautiful. But don’t stop there cucumber has topical skincare benefits too. It contains caffeic acid, to help to reduce inflamed or irritated skin, and it also hydrates due to its high water content. The peel has silica, which can help firm up sagging skin. Even people with the most sensitive skin types can use cucumber. 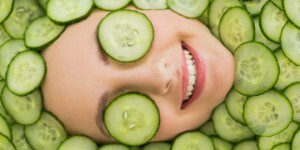 Spa Facial: Lightly puree 1/2 cup of cucumber and mix 1 to 2 tablespoons plain yogurt (look for one with active cultures). If it is too runny you can add a little oatmeal. Gently apply to clean dry face and neck. Relax for 15 to 20 minutes and rinse and enjoy your new glowing skin. Posted by Maryclaire Mayes on Friday, May 26th, 2017 at 03:34 and is filed under General.